SINGAPORE - Retail sales in Singapore rose 6.9 per cent in June from the same month a year ago, driven by another jump in the sales of motor vehicles, figures from the Singapore Department of Statistics showed on Friday (Aug 14). However, excluding auto sales, retail sales fell 3 per cent year-on-year. Sales of motor vehicles shot up 85.2 per cent year-on-year, with the Land Transport Authority having released a bumper crop of Certificate of Entitlement (COEs) for the May to July period. Compared to May, their sales were 26.3 per cent higher. When compared with May, retail sales edged up 0,6 per cent in June. Excluding motor vehicles, they dropped 3.9 per cent. 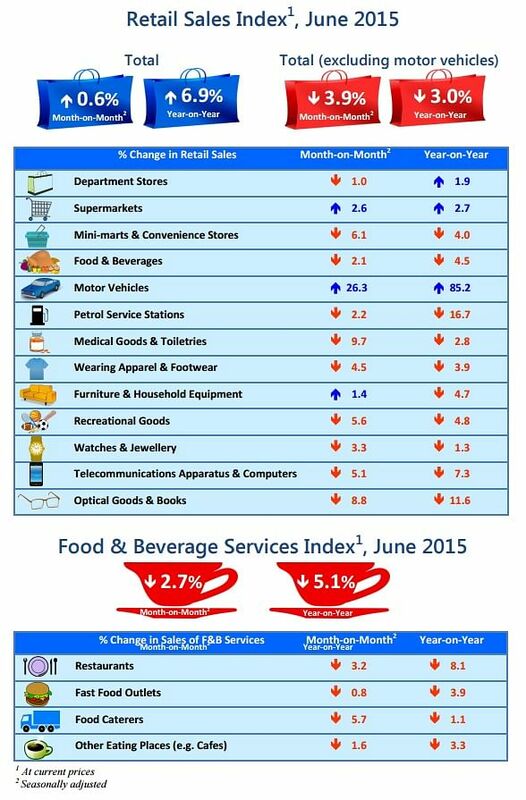 The total retail sales value in June was estimated at $3.5 billion, higher than the $3.3 billion in June 2014.